The Veterans Legal Clinic is featured in the following story, “In Service of Those Who Served: Law Schools & Veterans Legal Clinics,” written by Thomas Tobin and published on Mic.com Network on Feb. 22, 2017. For many of America’s veterans, help is coming from an unlikely source—the local law school. From Harvard and Yale to Widener and Wake Forest, law students are providing legal assistance to veterans through clinical programs. The programs can be a win-win for students and the community. Students gain hands-on legal research and writing skills and apply their coursework to real-world challenges facing actual people, not classroom hypotheticals. The Veterans Law and Disability Benefits Clinic at Harvard Law notes that students will be exposed to practice areas including administrative, probate and constitutional law. As law schools endeavor to produce more “practice-ready” graduates, the Clinic notes that students will have opportunities to question witnesses, draft legal documents, present arguments, and engage in negotiations. At Yale’s Veterans Legal Services Clinic, students have worked with service-members who became ill after drinking contaminated water at Camp Lejeune and petitioned the VA for further rule-making on disability claims for service-members suffering from PTSD subsequent to experiencing military sexual trauma. Depending on the jurisdiction, students may be admitted to practice in federal court to actively participate in ongoing litigation, as in the University of Pittsburgh’s Veterans Practicum. In more than two dozen law schools around the country, professors and students are providing veterans with pro bono assistance to assist with claims and appeals. As noted elsewhere, law school veterans clinics follow several models. Some clinics focus on advocating policy change and legislative action to benefit groups of veterans, rather than individual clients. Other programs focus on direct legal services, such as eviction proceedings or representing veterans seeking disability benefits. Numerous jurisdictions, including North Carolina, have set up Veterans Treatment Courts. According to UNC’s Jamie Markham, who served as an Air Force Captain prior to law school, veterans courts are “part court, part program” and focus on diverting veterans away from the criminal justice system and potential imprisonment. Paraphrasing Abraham Lincoln, Markham lauded these courts as “providing smarter and more effective justice for those who have borne the battle.” Over in Arizona, students at the University of Arizona’s Veterans Advocacy Law Clinic are “providing the majority of legal representation to veterans” in that state’s pre-trial diversion court. Many law school clinics started from student action in response to clear community needs. 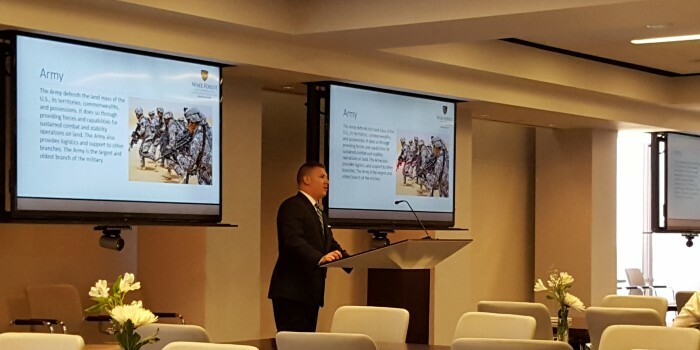 Such was the case at Wake Forest, where in 2014, former Marine Captain Brandon Heffinger (JD ’14) and second-year law student identified the need, developed an operational model, and helped the law school launch its Veterans Legal Clinic. The Wake Forest clinic was formally started in 2015 with four students working under the supervision of one professor. Heffinger now directs the Clinic, which primarily focuses on discharge upgrades and veterans related impact litigation. Law school clinics offer experiential learning opportunities for students, which can be particularly meaningful when these opportunities serve those who served in uniform. Thomas Tobin is a graduate of Harvard Law School and the Harvard Kennedy School. Tommy has served as a Teaching Fellow in the Harvard Economics Department and Instructor of Law at UC Berkeley’s Goldman School of Public Policy. His writing has appeared in scholarly journals and major newspapers, such as the Baltimore Sun, Charlotte Observer, and San Francisco Chronicle.